Takeaway: The yogic system of chakras reflects the same energetic and psychological development as Maslow's Hierarchy of Needs. There are some very intriguing similarities between the yogic chakra system and Maslow’s Hierarchy of Needs. The chakras, which can best be defined as energy centers within our subtle bodies, are found within the body, along the central channel or spinal column. This central column is called the shushumna nadi. The chakras can be understood as vortexes of energy that also act as clearing houses. We create energy in them, we process energy in them, and we also process information that’s coming into our consciousness. We can transform and transmute the energy within our chakras to become more balanced and whole human beings. 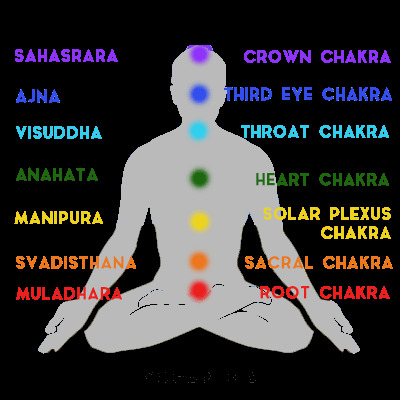 The chakra system maps how the body and mind unite. It also maps how our emotions live within our body. Interestingly, the chakras are directly linked to our endocrine system, as each chakra is placed where a major gland of the endocrine system resides within the body. Therefore, balancing our chakras through our yoga practice also helps us balance the hormones of our endocrine system. Here’s where the chakra system is related to Maslow’s Hierarchy of Needs: It is a psychological system that ultimately leads to self-actualization, and when all seven chakras are balanced, they ultimately do the same. Abraham Maslow came up with this hierarchy as a pyramid, which has at its foundation physiological needs, then safety needs, followed by love and belonging needs, then esteem needs and, finally, self-actualization at the top of the pyramid. It is a theory that maps human motivation and self-development. In the typical cycle of a human life, we move through various phases of self-development and motivation. Psychologically speaking, we all go through various rites of passage as we age. We develop different kinds of physical, emotional, mental and spiritual skill sets as we go. In the chakra system, the three lower chakras connect us to our outer world. After the first, the root chakra, the second chakra is the spleen chakra, which is related to the sexual organs and sexuality; then the third chakra, or the solar plexus chakra, is our power center. These three foundational chakras are related to everything external, career, money, relationships, family, sexuality, power, physical body, etc. This chakra trio corresponds to Maslow’s physiological needs and safety needs. We do yoga to balance our chakras because, depending on how we were raised, what we inherited genetically and what traumas we might have sustained, our chakras might be deficient or excessive in nature. Because all the chakras work together, if one is deficient, another might begin to work overtime and end up overcompensating for the deficient one. If you have an interest in psychology, then you’ll want to study up a bit on Maslow’s Hierarchy of Needs, as well as each particular chakra. Bridging yoga and psychology can take your practice to another level. You’ll be forever growing and evolving as you work with your chakras to restore and sustain ultimate well-being.